Happy spring, friends! You know how much I love this time of year! 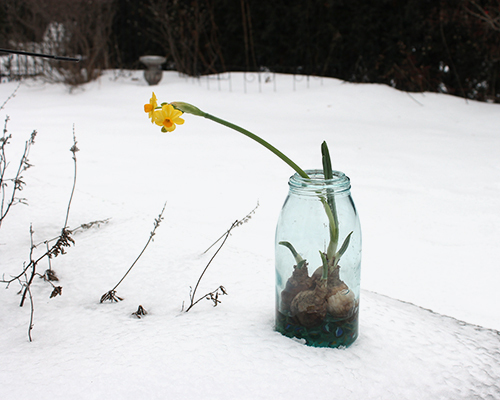 My garden is still sleeping although I'm seeing little signs of life--the tiny tips of bulbs poking through the earth. There is snow predicted for later this week, so we aren't quite in spring weather mode yet. Last week, Instagram announced that it will be changing our feeds from chronological order to what they think we want to see most. Uh huh. As if we asked. I feel brain cells disappearing with each 'helpful' algorithm introduced on social media sites. We all know it's really about money and it will very likely make it harder for individuals and small companies to be seen. It's sad to think that Instagram will turn into another Facebook--although with Facebook as its owner, I knew it was just a matter of time. I love Instagram so much. It's such a warm, creative place. I hope that it won't lose all of its charm and will still be a place where creative folks can meet. We will see. 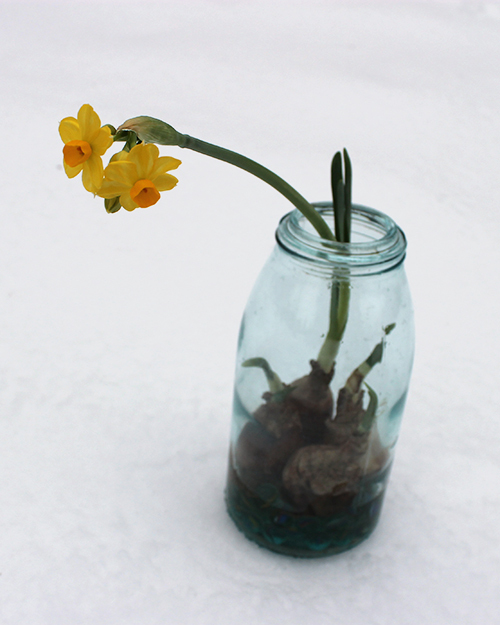 My indoor potted daffodils have given me so much pleasure this past month as I waited for spring to arrive. The first daffodil bloomed on February 25th and there are still new ones opening each day. In the autumn, I layered a whole bunch of mixed daffodil bulbs in three big pots that I usually have outdoors for summer annuals. 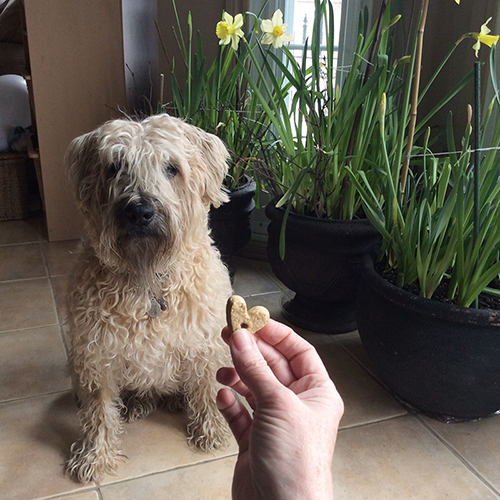 I can't wait to see the bulbs I planted outdoors too. There's so much anticipation this time of year. And in other news, this bundle of curls turned six years old last week! Meeko is such an important part of our family. His daily companionship means the world to me. I wish you a lovely spring (or autumn if you are in the southern hemisphere)! 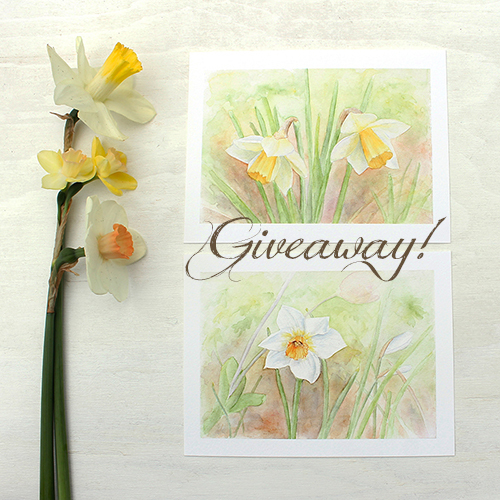 If you'd like to see more of my spring art, you can see it here. Hello, March. We meet again...somewhere between snow and sunshine, ice and flowers. There's a blizzard on the way tonight. Don't worry! I brought my vintage jar back inside right after I took the photos. 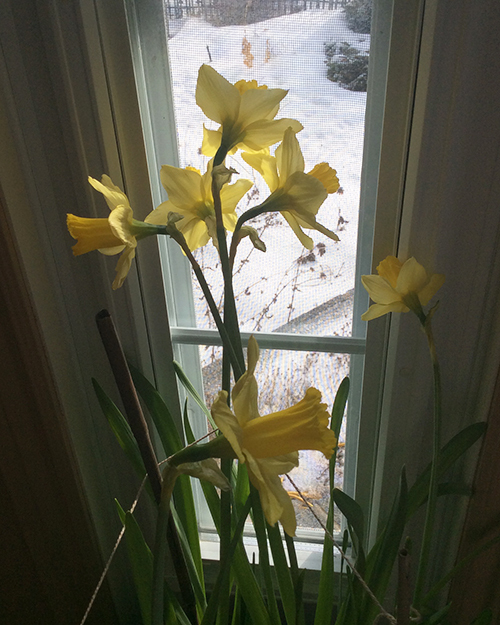 I keep it by our dining room window and have been enjoying watching the bulbs' progress. 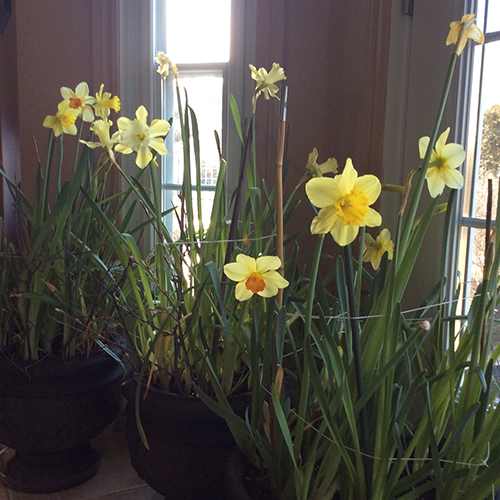 I also have a big pot of daffodils blooming just inside the back door. I wish you could smell them. They are wonderfully fragrant. Doesn't it look like they are huddled together looking out and talking about the weather? Like the rest of us. Emma and Chloé both have their March break this week. I suppose it's not the worst time for a blizzard. They both have a huge number of assignments to complete for school although they've found a bit of time for baking too. I've been busy with my shop, when I'm not dreaming of snow melting and spring flowers blooming that is. I recently organized my art by the season. 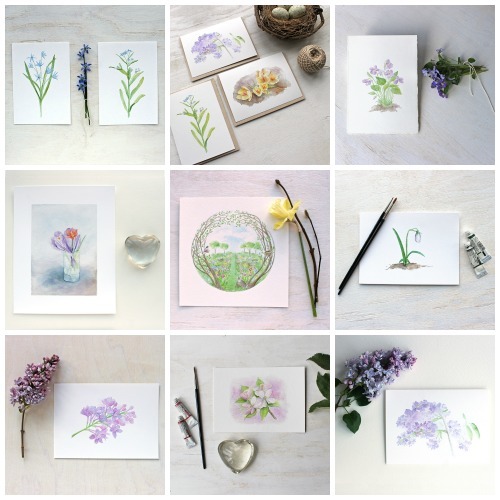 If you are aching for spring too, you can have a look here.